Opis: High above Laguna Beach last month hung bright celestial orbs. 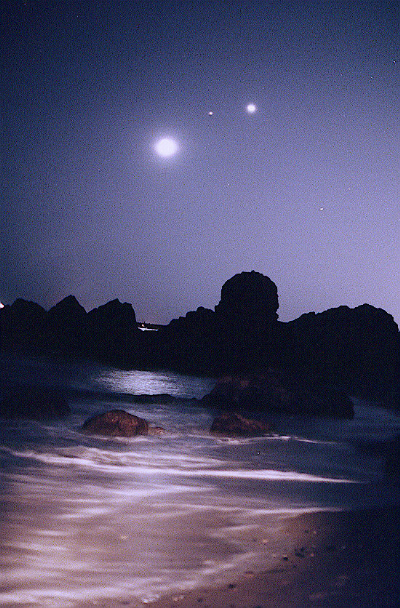 Visible after the California sunset were, from left to right, the Moon, Saturn, and Venus. Tonight and for the next few days, Venus and the Moon will again be visible together. Nearby stars will include Pollux, Castor, and Procyon. Venus now sets hours after the Sun and is so bright it might be mistaken for an airplane or UFO. Binoculars should enable the viewing of craters on the Moon, and phases for Venus.